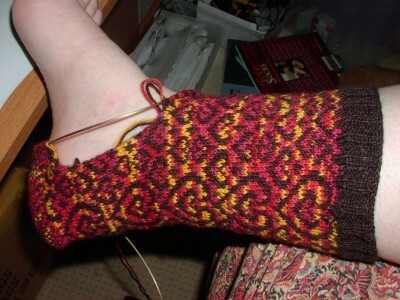 ...the heel flap is coming back out. 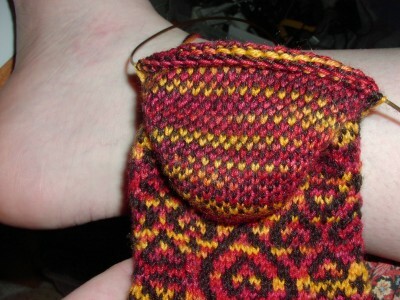 Several problems with the heel flap.. maybe it doesn't look too wrong to you, but it's annoying me to no end! ...and two large hearts is too long. ...so I have to rework the pattern a bit to give me one large heart plus a small one? or something. ........I worry that I may possibly need to diminsh the number of stitches in the heel flap to keep the heel from getting too wide. I'm hoping not because that would be a lot of lost work, but... I'd like to have socks that actually fit right at the end of it! This "spare set of socks on needles" thing may also be my self-reassurance that I really do know how to knit a pair of socks! ... when I spent too much time reading Dostoyevski and Kirkegaard "for fun" I felt REALLY dumb. .. then I read Harry Potter and was much reassured that I could actually read. This pair of back-up socks feels eerily similar! 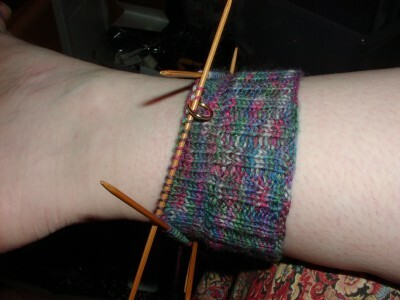 I do see one good thing about those socks, though - no more pooling! Trekking yarn rocks I love the way it knits up. Heads Up! Secret Pal 8 is Starting Soon! Not Too Late for Pink and Red!